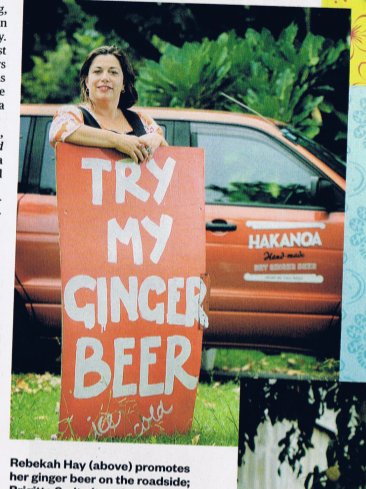 HOW HAKANOA TRADITIONAL WILD FERMENT GINGER BEER BEGAN. This is a story about the classic ginger beer that used to be made in homes all over NZ back in the day. When I was a kid, in the 1970’s, I used to help our close family friend Joan make ginger beer at her home. Joan had a ginger beer ‘plant’ or ‘bug’ – a jar of cloudy liquid that she kept in a cool cupboard and fed regularly with ginger and sugar and water to keep it bubbling. Joan would always make a brew a week before her kid’s birthdays, so all the bottles would be nicely fizzy ready for the birthday party. I was one of the crew that she set to scrubbing out beer bottles before carefully filling them up using a jug and a funnel. Each bottle full of the new brew got a sultana put in it before the caps were hammered on with a capping block. We’d put them a cool spot in the back of the garage. A few days later, when the sultana was floating at the top of the bottle, you knew it was ready. One year Joan’s husband moved some stuff in the garage around and exposed the bottles to bright sunlight. Some of them got too hot and blew their lids off. He got quite a telling-off from Joan, because there was a chance the bottles could’ve shattered too, making a safety hazard as well as a sticky mess. We loved it all the more because of the risk, it was so exciting to a 7-year old! Skip ahead to 2007 – I was living in Hakanoa Street in Grey Lynn. I’d returned from nearly 10 years living in London. I like cooking – a lot – it’s always been my favourite pastime. Amongst other glorious foodie things I like to do, I made 2 loaves of sourdough bread for our household – every week for 9 years – carefully nurturing my precious sourdough starter. I even dried it out so I could take it back home to NZ with me. NZ Customs were very understanding when I showed my dubious looking plastic bag of sticky white powder to them! I find the whole fermentation process of the sourdough culture transforming plain flour & water into a delicious loaf completely fascinating. When the 2008 Global Financial Crisis hit I was made redundant. l was longing for a complete change of career. Ginger Beer had been suggested by my now-ex husband, and I decided to try it out. I freelanced for another year while I formed a semblance of a business plan, and established Hakanoa Handmade Drinks in December 2009. First, I wanted to make ginger beer just like Joan’s. It’s what I liked and I couldn’t find it anywhere. In the months before I made the plunge into starting a business I had various brews all over my kitchen, a chart on my fridge, and luckily for me – some very discerning and frank friends. it took a few months, but eventually my ginger beer tasted just right. I got a little red van, rented a bit of kitchen space in a cafe that was closed on the weekends, moved my 30-litre home brew barrels in and spent every weekend split between filling bottles and selling them to people from the side of Meola Rd in Pt Chevalier. I made a new brew every week – not all of them entirely successful! – but when I got it right, people loved the just-like-I-remember-it flavour and super-quenchiness. I learnt so much on that roadside, I grew from being shy and hesitant about my ginger beer to confident and just a little bit proud. Mostly I felt pretty nervous though! Dear friends stood with me, complete strangers stopped and quizzed me – and everyone was incredibly generous with advice. I loved what I was doing, but brewing fresh ginger beer proved terribly wasteful as a business practice. After much research, even though I firmly support sustainable business practices and apply them everywhere I can, I had decided to use plastic bottles for obvious safety reasons. The ginger beer didn’t last long at all – 2 to 3 weeks if you kept it nice and cold. But not everyone kept it cold enough. If it wasn’t all sold in time, the old stock was un-sellable because the fermentation process continued making a bit more fizz AND a bit more alcohol. Once the alcohol creeps over 1.15%, it’s above the legal limit for a soft drink and we have to dispose of it. Roger King joined Hakanoa in early 2011 – just over a year since I had set out. By now I realised I really needed a business partner to share the load, and we had been introduced by our mutual friend Pam Corkery. He offered his help and our business partnership began. Roger quickly saw the major flaw in the Hakanoa plan. Sometimes we’d be standing at the bin, after a couple of wet Auckland weekends, chucking in dozens and dozens of bottles we’d brewed and filled and capped and labelled and chilled and lifted and hauled. All that work AND all those materials going into the recycle bin. Clearly it had to stop. 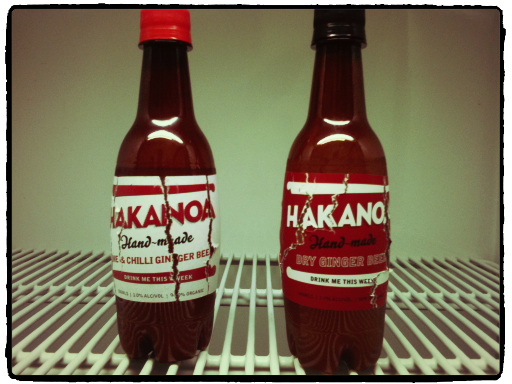 We set about researching all the ways that we could give Hakanoa real proper ginger beer a decent shelf life. We are both utterly determined that Hakanoa products contain nothing but good food ingredients, so preservatives where ruled out from the start. Sterile filtering removes all the live cultures and all the cloudiness and a great deal of flavour, so that wasn’t an option either. The only remaining option was pasteurisation – heating the ginger beer just enough to kill all the wild yeast and lacto-bacilli that have done the fermenting. It’s a fizzy drink, so the heating must be done after the bubbles are sealed in the bottle. It can only be done in glass – which is much easier to recycle than the plastic we had been using. It looked better and and holds the cold nicely making for a better drinking experience – indeed switching to glass had a lot of real positives for our little Hakanoa brand. We already had hundreds of customers who loved the taste of the traditional unstable stuff in the plastic bottles. We loved everything about the real stuff too, apart from it’s volatility. So we agreed our pasteurised ginger beer had to taste the same as that or we’d give it up altogether and just stick to our ginger & chai syrups. But it didn’t stop there – once we had our methods nailed, we had to find a brewery kitted out with the right pasteurisation gear that we could work with. We aren’t big enough to own that gear ourselves. Nor are many craft beer brewers. It’s common practice in NZ and the world over for small brewers, soda makers, and even wineries to contract their work out to bigger facilities that can afford to own and run expensive gear. It is your recipe that is unique, not the gear you use to make it. But we were rejected by every beer brewer in NZ – we approached them all! – because of our wild ginger beer ‘plant’ or ‘bug’. Brewers didn’t want our wild lacto-bacilli culture to escape into their beers. We didn’t want their beer yeasts to escape into our ginger beer either. It was months since we’d got our recipe nailed, and we still didn’t have a brewing partner. It was during this phase that I came up with the phrase “MADE THE HARD WAY”. It’s printed on all our ginger beer bottles for very good reason! Finally we went to Beerfest Auckland in March 2014 and I went to every stand and asked if anyone knew of a brewer with the gear we needed. One kind person put us onto a winery in Tauranga, which lead us to a cider maker called Sam who – after a lot of convincing – decided to take us on. We provided our own tanks so that our wild ferment could bubble away without threatening anything else in the cidery. We watched it like hawks, and when it had fermented to just the right stage, we carefully decanted it into Sam’s 5,000 litre bright tank, chilled it down and balanced out the flavour with a little extra lemon juice. We topped up the naturally produced CO2 with a little extra so the whole brew would have just the right not-over-the-top fizz. The filled bottles went through Sam’s Tunnel Pasterurizer, set to our specifications, then came out the other side, perfectly balanced in flavour and perfectly safe to store. 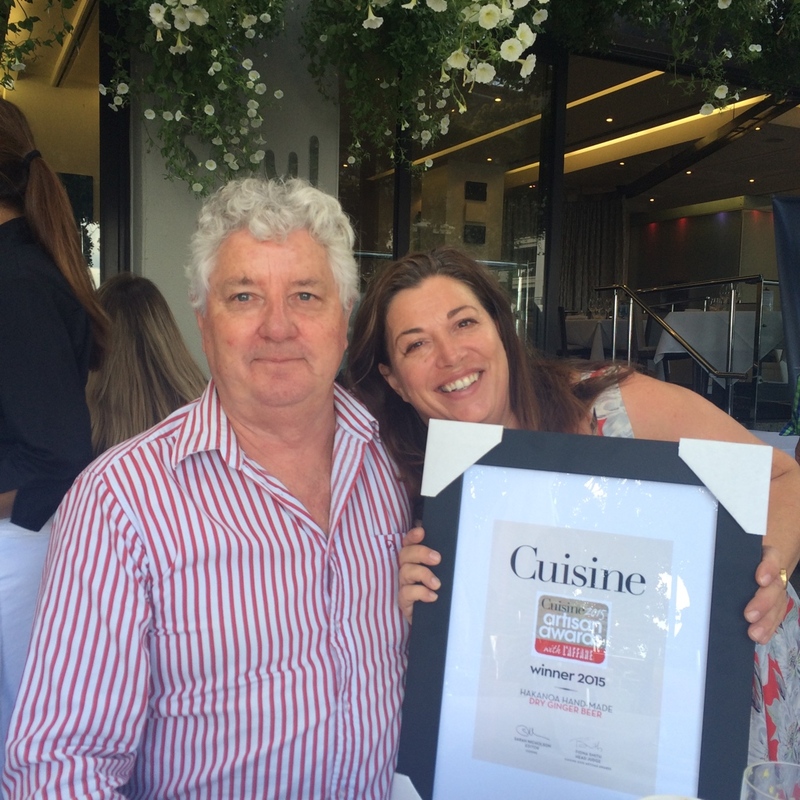 We were elated with the results, and entered that first brew into the 2015 Cuisine Artisan Awards – and it won that year’s beverage award. It’s hard to describe how satisfying that moment was! 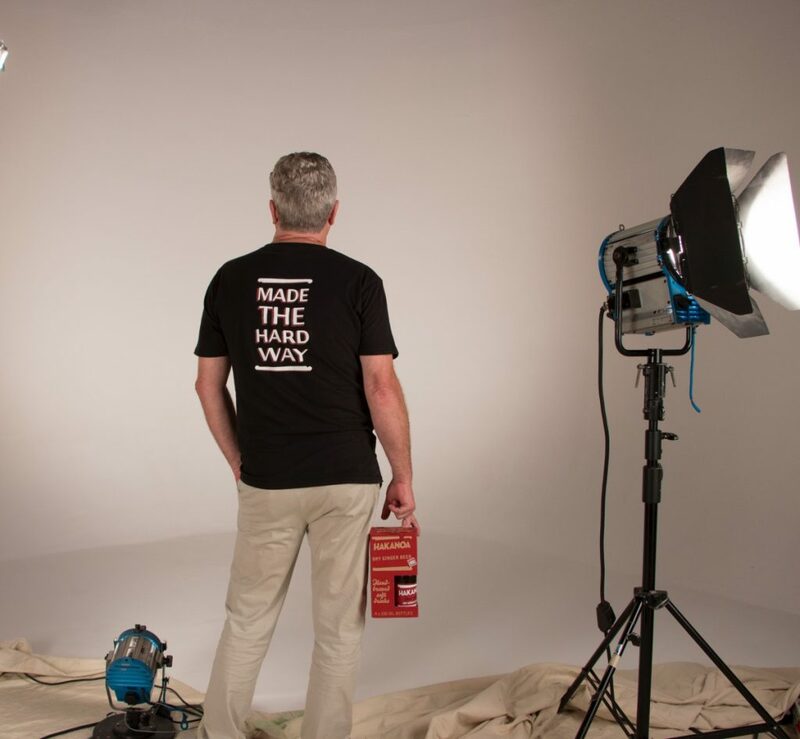 We’ve been happily cracking on with making more of it ever since. REBEKAH, 2010 – THE FIRST YEAR. CLEAR WARNING ON THOSE EARLY BREWS. 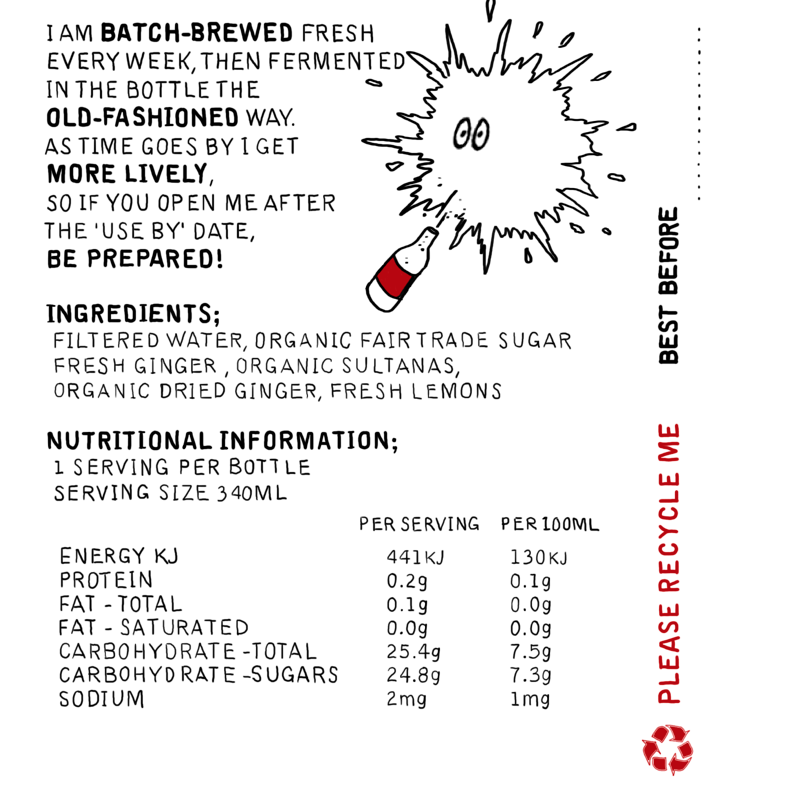 WARM UNPASTEURISED GINGER BEER IS MAKING THOSE BOTTLES SWELL UP…EXPECT A FACEFUL IF YOU OPENED ONE. 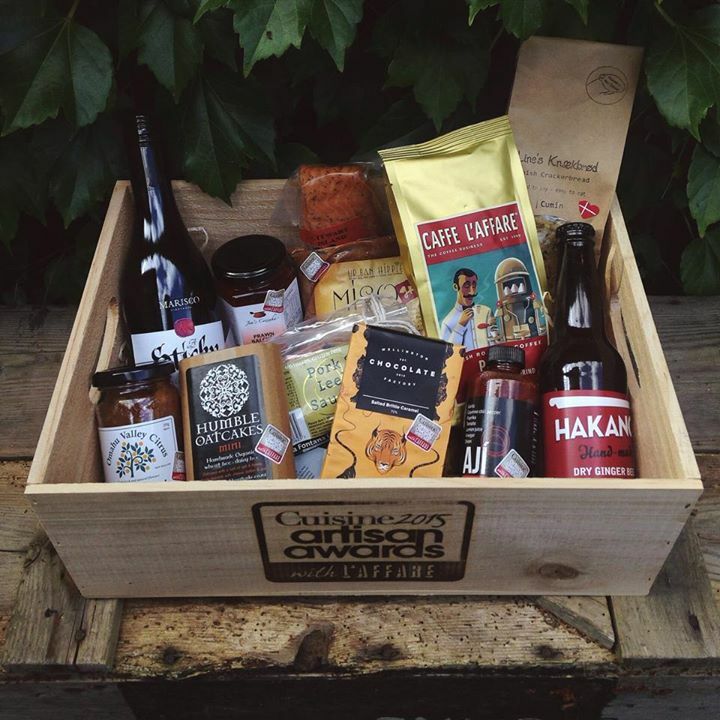 HAKANOA IN THE 2015 CUISINE ARTISAN AWARD WINNERS BOX. WORTH ALL THE HARD WORK. WHAT MAKES A PERFECT GINGER BEER?